Otter + Pop is available in the classic Defender Series and sleek Symmetry Series case designs, offering two protective options that easily swap with any PopTop. FORT COLLINS, Colo., March 26, 2019 /PRNewswire/ -- Otter + Pop Symmetry Series and Defender Series brings together two favorite phone accessories in a swappable case collaboration. New from OtterBox and PopSockets, Otter + Pop cases are available now in a wide array of colors and graphics. "Otter + Pop collection brings in a fresh take on two innovative products," said OtterBox CEO Jim Parke. "With added colors and graphics, you have even more ways to express yourself. The addition of Defender Series into the case mix is an exciting opportunity to protect devices with an OtterBox original while allowing you to personalize your case daily with the swappable PopGrip." Newly announced, Otter + Pop Defender Series integrates a PopGrip into an OtterBox Defender Series case for ultimate protection. With a variety of case colors and swappable PopTops, Otter + Pop Defender Series can be customized for any adventure. Otter + Pop Defender Series is available now for iPhone and Samsung devices. Otter + Pop Symmetry Series brings the fun of PopSockets to a slim Symmetry Series case in a low-profile, one-piece design. With an array of color and graphic options, Otter + Pop Symmetry Series is available now for iPhone devices. 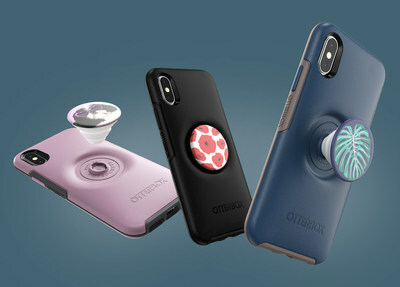 Otter + Pop cases are available now at otterbox.com, popsockets.com, Target and Verizon.